Thoracolumbar junction (TLJ) syndrome, sometimes described as: ‘Maigne’s syndrome’, lumbodorsal syndrome, or posterior ramus syndrome, is a common spinal disorder that is often overlooked by physiotherapists, chiropractors and others involved in the treatment of lower back pain. Due to the subjective nature of the 4 primary diagnostic criteria, some clinicians refuse to accept that the condition even exists. Lower back pain in the region of the sacroiliac (SI) joint is perhaps the most common site of pain reported by those suffering from the condition. Consequently it is often assumed that it is the SI joint itself that is dysfunctional, and not the thoracolumbar junction between the 12th thoracic vertebrae and the 1st lumbar vertebrae. In fewer cases, the dysfunction actually occurs between the 11th and 12th thoracic vertebrae. The TLJ is the ‘transition’ site between the thoracic and lumbar regions of the spine and as such it is the point at which the fluidity of movement between these two spinal segments most often breaks down. The structure and function of these adjacent spinal regions does differ somewhat; the lumbar spine for example has almost no rotational ability, while the thoracic spine is able to rotate because the facet joints in this segment are aligned in the frontal plane, as opposed to those in the lumbar spine, which are aligned sagittally. It is well documented that the 11th, 12th thoracic, and the 1st lumbar vertebrae are the most common sites for spinal trauma. When the rotational force (torque) from the thoracic spine passes through into the lumbar vertebrae, as would be the case during many twisting and turning actions, the surrounding tissues must absorb this force to protect the lumbar spine from also twisting or rotating. The more times these motions are repeated, especially under load, the greater the risk of irritation and inflammation in the surrounding spinal structures. With Maigne’s syndrome, the pain most frequently presents only on one side (unilateral) of the spine and rarely, if ever, affects both sides simultaneously. Additionally, sufferers of the syndrome almost never complain of pain affecting the TLJ itself. The pattern of pain usually radiated along the pathway of the nerves that leave the spine at the TLJ. The primary groups of nerves exiting the TLJ include the anterior ramus, posterior ramus and the perforating lateral cutaneous branch. Figure 1 shows the distribution of these nerve groups and illustrates the common pathways that pain is often referred in those suffering from TLJ syndrome. Dr Maigne states, “the most frequent manifestation of TLJ syndrome is lower back pain, which is exactly like the lower back pain of lumbo-sacral or sacroiliac dysfunction.” The most frequent cause of TLJ syndrome is what Dr Maigne refers to as a painful minor intervertebral dysfunction (PMID), that is, inflammation, irritation and even mild degeneration of the intervertebral structures. PMID can be “active”, causing local pain, weather at that specific site or referred elsewhere through reflex actions. It can also be “inactive”, and as such would not cause pain and may only be discovered accidentally during a routine examination of the spinal structures. In summary, TLJ syndrome commonly presents as unilateral lower back pain that frequently results in pain in the lower lateral region of the spine, groin pain and/or an aching or painful sensation that radiates above and along the pelvis and into the pubic region. Due to the referred nature of the pain, healthcare professionals often overlook the syndrome and instead seek to treat the symptom rather than the cause. Consequently, those suffering from Maigne’s syndrome are plagued with the condition for many years before an effective diagnosis and treatment is made. 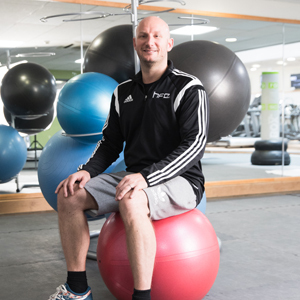 If you’re interested in furthering your knowledge about low back pain and becoming a recognised Level 4 exercise specialist, we recommended the Low Back Pain Certificate.